"The temporary library at 25 Kenwood Circle is full of excited librarians, bustling about and getting ready for their big move back into the Main Street location after 17 months of renovations and additions. Library Director Felicia Oti said most of the big moving will start on Monday. The library will stay open at its temporary location until Saturday. Oti said residents can expect the library to reopen on Main Street in about four weeks. Once the library reopens, all return fees will be waived for the first two weeks. No return bins will be available during the transition." 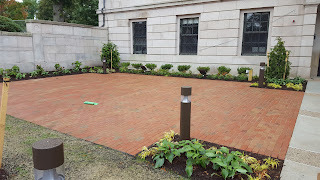 brick patio with commemorative bricks. Did you buy one?